One of the main triggers for poor employee morale occurs when employees feel their contributions to the company are not appreciated. Employee recognition programs are designed to single out individuals who have over-performed in their role, thanking them for their contributions and singling them out among their peers. 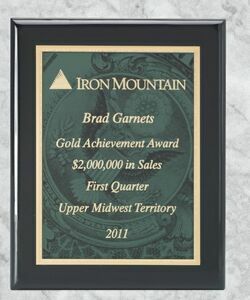 The best award programs consider every role within the company, from sales positions to administrative support. The criteria should be clearly defined and provide employees with an idea of how they can be recognized in the future. These 2" thick acrylic obelisks sparkle with style and make a lasting recognition statement! They can be Screen Printed or Laser Engraved. 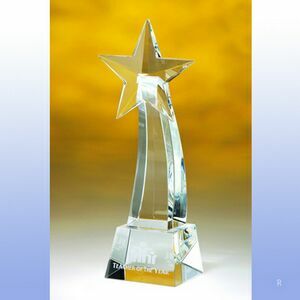 Award the star of your team this solid crystal column with clear base. The crystal star that sits atop the award makes it an honor to give as well as receive. This can be screen-printed to order. This 8”x10” piano wood finish plaque in jet black with has a 6"x8" Green/Black marble money design plate that is lasered to order. Perfect for your sales team! Award your employees and boost morale this season. Contact Crackerjack Promos online or call us at 1-800-704-7155 for even more employee recognition options and to place your order. Since 1980, Crackerjack Promos, Long Island, NY, has helped customers promote their company with thousands of choices of promotional products, such as calendars, towels, shirts, hats, jackets, pens, cups, mugs, lapel pins, computer-related, key chains, food items, candy, trophies, plaques, awards, watches and more. We Imprint Minds!